How would a company function if its top leadership trusted each other deeply and truly shared a common vision for the future? This question burns in my mind as I ponder the impact of the retreat I attended last weekend. I met Siraj while making contact with the Washington DC Agile/Scrum scene. I had offered to help him make high quality photographs of his collection of "influence maps." Having just moved to the DC area, and having time on my hands, I thought that some small acts of service would be a good way to get to know and integrate into the Agile community here. An influence map is both a discovery tool and an information radiator for reflecting on and telling the story of your life. It was fascinating what I could learn about people I had never met just by looking at their maps. There was always something mysterious about Siraj. As his name suggests, he is of Indian origin, but he grew up in Middle East and studied in a Jesuit school. His life has always been driven by the questions, 'Why am I here?' and 'Whats next for us?' So when he invited me to attend a weekend retreat on change leadership based on these influence maps, I was intrigued and just had to come. His model for influencing change is called The Influencers Mantra, and the monthly retreat to learn this model is called Temenos, which is the Greek word for "container." Just as you can't control your heartbeat, you can't control the container. But you can influence your heartbeat (and many other reactions) by controlling your breathing. Temenos is about how to influence containers of people like a marriage, a partnership, or a company. Warm-up on Friday evening - a fancy word for dinner (and maybe some wine) and otherwise getting to know each other. Any group of people, like a company, a partnership, a team or a marriage is a container. A container is not a soldier to be commanded, it is a woman to be wooed. It is also a raging fire which will will burn you if you take the wrong approach. Having been burned several times and having wooed an organization once or twice, I recognize the truth of this statement! Listening and Observing are the keys to influencing the container. So most of the time in the workshop is spent listening and observing: 1) Understand yourself and each other by creating and sharing influence maps. 2) Create a clean slate to start afresh. 3) Understand your and each others' Personal Vision. 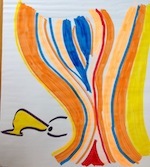 4) Working as a group, create a compelling shared vision for moving forward. 5) Supplication. Influence maps and Mandalas are both visual representations (or information radiators, as Agilists would call them). The Influence map represents your life to date, and the Mandala represents either your personal vision or the shared vision of your container. 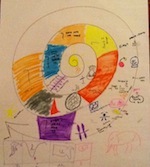 Personal Vision - draw a Mandala and share your vision for moving forward at a personal level. By the end of the Personal Vision exercise, we understood ourselves and each other so well, that we could talk to each other about anything, without fear or insult! I call this state Deep Trust. It's amazing. It is the perfect state for creating a compelling shared vision for the future. Supplication was perhaps the hardest to grasp. "Supplication" is the process of bowing down in prayer. It represents a humble attitude towards the organization. I use the analogy of wooing a woman. I remember the night I met my future mother-in-law. There were only two chairs in the room, one for her and one for my future wife, so I literally sat at their feet! It seemed a bit a odd at the time, but it helped create a lasting, positive impression. In the successful change initiatives that I have coached, I have taken a similar approach, offering information, while encouraging those doing the change to figure out the best direction without telling them what the answer should be. I came home exhausted, but full of energy and enthusiasm for this approach (and for my own future vision). I started making changes right away in my life and in how I deal with people; these were also noticed immediately. The approach seems to resonate. Everybody I talk to about it seems to get really excited: Connecting with your friends, colleagues, co-workers and even family members seems to be a deep need for many people. And I still ponder the question, what would your company be like if your top leadership deeply trusted each other and truly shared a common vision for the future? Sounds like an interesting journey could you give more detailes about each step the workshop to be able to do it with my new team? I will be assisting him at a workshop at Glasscon on June 8. If that doesn't work for you, why don't you contact me offline, e.g. via email or twitter.